Need a classy, yet nerdy, storage space for your favorite libations? Well, the force of booze is with you because we've found the perfect bar just for you. 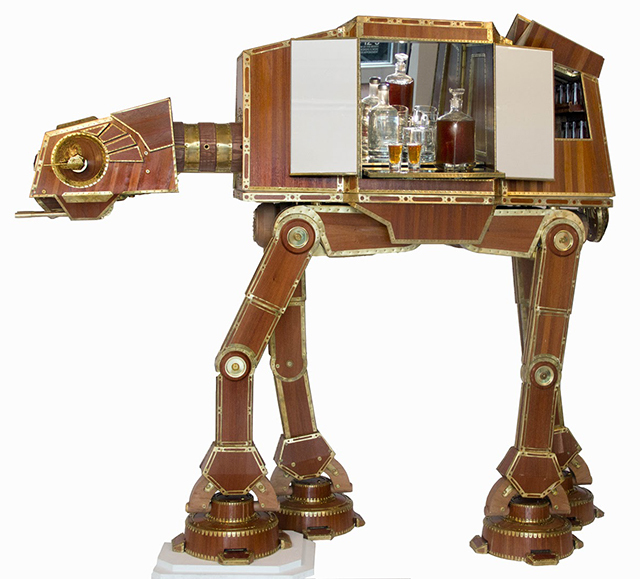 Designer Colin Johnson brings "The Emperor's Cabinet," an AT-AT with touch of steam-punk grace. Previously on display at the Hot Art Wet City Gallery in Vancouver, B.C., Johnson is now looking to sell the one of a kind, hand-crafted piece. If you're interested, you can contact Johnson via his blog about purchasing it. Serious offers only, you filthy Nerf Herders!